Fellow wine lovers, listen up. I have news relevant to your interests - and you're not going to like it. It has come to our attention that the world is experiencing a wine shortage. HOW ON EARTH ARE WE GOING TO COPE? According to the International Organisation of Vine and Wine (how we weren't already card carrying members of this fine organisation is beyond us), wine production in 2017 has fallen - to the lowest levels in 50 years. It's enough to drive us to drink (but only one glass, obviously, because rationing). In a press conference held at OIV headquarters, Director General Jean-Marie Aurand, explained the sad state of affairs, noting that "extreme weather events", everything from frost to drought, impacted wine production, specifically in Europe. In 2017, there were around 247 million hectolitres of vino produced worldwide, down 8 per cent on 2016. (A hectolitre is 100 litres). 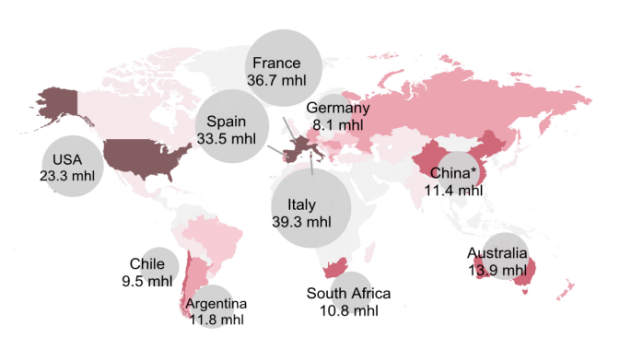 "This level of world wine production is historically low, with such levels not having been seen since the 1950s and start of the 1960s," the OIV states. Production was particularly bad in Western Europe, which the Wine Bosses attribute to "unfavourable climate conditions". In fact, wine levels were at an "historic low" in Italy (39.3mhl), France (36.7mhl) and Spain (33.5mhl) with Germany also down (8.1mhl). As you can imagine, everyone is taking this news extremely well. Thankfully, however, it's not all bad. Australian production grew a respectable six per cent with a none too shabby effort of (13.9mhl). And while New Zealand levels dropped slightly, they remained "very good" (2.9mhl).